Jordan Glenn & Jason Hoopes have played at Studio Grand on numerous occasions and have been friends to and supporters of the space. They are pleased to bring you four consecutive nights of collaborative improvisations with a diverse set of musical friends. Detroit native and general wanderer Evelyn Davis is an inside/prepared/new music pianist, improvisor, pipe organist, composer, vocalist, synthesist, teacher, songstress, and maker of/participator in oddly shaped musics with an occasional side of performance art. She improvises and has recorded with Phillip Greenlief, Fred Frith, and Michael Zerang, among many other esteemed musicians from Chicago and the Bay Area, and recently played two European tours with Chicago-based Cheer Accident which included appearances at Rock in Opposition festival in Carmeaux, France, and Different Sounds Festival in Lublin, Poland. Evelyn holds degrees from in Jazz (SWCC) and formal Composition (Indiana University) and has her Master’s degree in Performance and Improvisation from Mills College. Evelyn created and performed the music of Frankenixon, with the help of a rotating cast of buddies, notably including the incredible guitarist Joe Kiplinger. She has also done stints in Joe Terry's Sound is a Moving Thing and Cheer-Accident. Julie Moon is a musician, studying and exploring music through the roles of performer, improviser, and composer. As a performer, she strives to deliver music with the gestural authenticity and physicality of improvisation, whereas aspects of her improvisational vocabulary are derived from studies in piano music. Her current projects are aligned with personal explorations that invite audiences to experience these emotional journeys themselves. 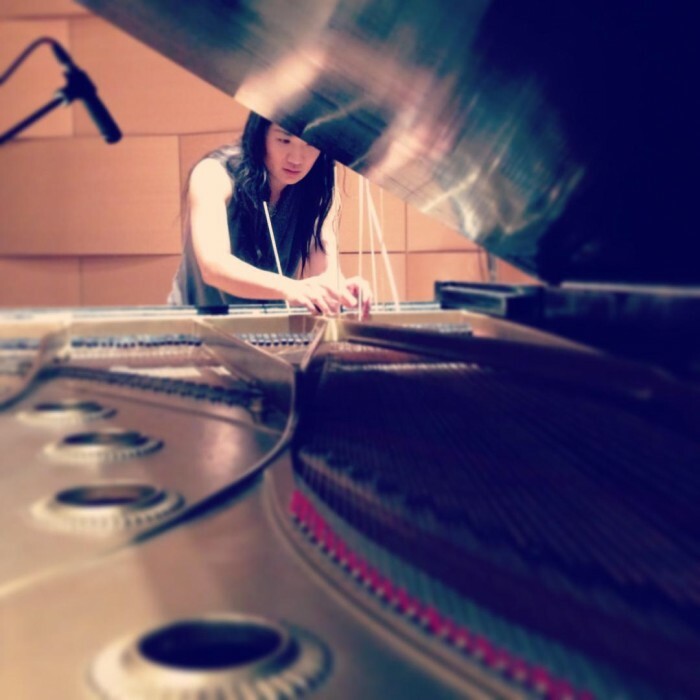 She studied piano performance at KNUA (Korea National University of Arts) and holds a BA in Music with a CiTA (Computing in the Arts) Psychology concentration from Cornell University and an MFA and MA from Mills College. “I was born and raised in the Pacific Northwest. My early years involved drawing cartoons and taking dance classes from my aunt. At the age of 12 music and movies took over. I studied classical percussion, jazz and made short movies with my friends during high school. During college I played a lot of dinner-jazz gigs and recorded/toured in various rock bands. Current projects include the longstanding group Wiener Kids and the large ensemble Beak, among others. Jason Hoopes is a bassist and educator. Glenn & Hoopes also play in the Fred Frith Trio, which toured Europe in 2015 and recorded the CD Another Day in F**king Paradise for Intakt Records in 2016. “When I proposed this trio I had nothing in mind beyond getting together with a couple of formidable musicians who I love and respect and seeing what would happen… Jason’s stunning ability to wring everything there is to be wrung out of an electric bass was as liberating as Jordan’s playful, irreverent, and absolute authority.” – Fred Frith. $10-15 at the door or get a special discount all-residency pass for $35 including fees - only available until 11/30/17 at 4pm.